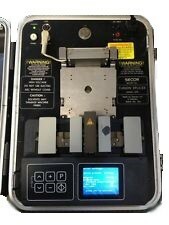 Siecor Corning M90 Fusion Splicer 2000 Series is the ideal splicer for all your Singlemode and Multimode splicing needs. It is affordable yet durable and in excellent working condition. This unit was recently calibrated, saving you costly calibration and repair fees. Calibration is not needed for another year!